A diagram of the LIGO detector, which will detect the ripples in space-time by using a device called a laser interferometer. The time it takes light to travel between suspended mirrors is measured with high precision using controlled laser light. A $205million upgrade will allow a laser-wielding observatory to monitor tens ofthousands of galaxies for mysterious gravitational waves. Leadinginvestigators are confident that the Advanced LIGO (LaserInterferometer Gravitational-wave Observatories) Project will be able forthe first time to detect gravitational waves from neutron stars and black holes,as predicted by Einstein's theory of general relativity. "Withthe limited LIGO range at time, it wasn't guaranteed detection," said Albert Lazzarini, deputy director of LIGO at theCalifornia Institute of Technology. "With Advanced LIGO, it'd be verysurprising from a relativity perspective if we didn't observe anything." Gravitationalwaves are ripples thought to occur in the fabric of space-time that result frominterstellarcollisions, explosions, or the dramatic movement of large and extremelydense objects such as neutron stars. Those ripples can then pass through thespace-time that Earth occupies, causing a slight distortion which Advanced LIGOis meant to pick up on. LIGO triesto detect gravitationalwaves using highly precise lasers to measure the time it takes light to travelbetween mirrors. Two sets of facing mirrors sit at a 90 degree angle, formingsomething like an "L" shape that meets at a corner. 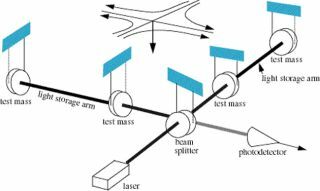 A laser beam is shotthrough an "L" shaped splitter at the corner, which splits the beaminto two beams that strike each set of mirrors. The laserinterferometer measures how long the laser light bounces back and forth betweenthe mirrorson the "L" legs before returning to a light detector at the"L" corner. They should theoretically return to the light detector atthe same time because the mirror legs are identical distances ? unless apassing gravitational wave distorts the local space-time fabric and changes thedistance. But theobservatory, operational since 2002, has yet to detect the elusive,still-theoretical waves. Scientists foresaw that advances in laser technology andmirrors would allow for even greater sensitivity when LIGO was first proposed,and so the Advanced LIGO Project became a natural upgrade for the observatory.The National Science Foundation recently approved the proposal to upgrade LIGOover the next seven years, starting with $32.75 million in 2008. "Thefirst several hours of observation with new instruments will equal almost thefirst year of observation with LIGO's current instruments," Lazzarinisaid. "We can probe something like several hundred galaxies out to theVirgo cluster [59 million light-years away] with LIGO, but increase that by afactor of one thousand and you go to the cosmological regime of measuring manytens of thousands of galaxies." Thatthousand-fold increase in coverage comes from boosting LIGO's sensitivity 10 timesover. Larger mirrors made of better materials will reduce thebackground "noise" from the random motion of atoms at roomtemperature, and the laser power is being pumped from 10 watts to 180 watts.Advanced LIGO will also be better cushioned from any terrestrial vibrationscoming through the ground, thanks to an active servo-controlled system thatreplaces an older, passive spring system. "Weachieved several milestones with the initial LIGO sensitivity," Lazzarininoted, pointing out that the two main LIGO facilities at Hanford, Washington and Livingston, Louisiana had just finished a two-year run to test the design'ssensitivity. LIGO requires at least two widely separated detectors workingsimultaneously to rule out false signals and confirm when gravitational wavesmight pass through the Earth. AdvancedLIGO may eventually become part of a greater global network of gravitationalwave detectors, thanks to strong international collaboration. German and British contributors are providing the laser andmirror suspension systems respectively for the upgraded observatory, andAdvanced LIGO has grown its cooperation with Europe's Virgo detector located near Pisa, Italy. Japan has also begun working towardsbuilding a gravitational wave detector. "Thegravitational wave community supports very strongly indeed the upgrade to LIGO? this upgrade was in fact planned from the very start of the LIGO project andhas always been an integral part of the planned evolution of the detectorperformance," said Jim Hough, University of Glasgow physicist.